happening and when it is not. “It is said that the key to a long healthy relationship is the ability to listen. Yet in today’s world of fast paced socially-driven online communication the emphasis seems to be shifting to how (quickly) we can put our points across, rather than taking time to listen to what people around us have to say,” writes Nick Maynard. However, conflicts and misunderstandings based on poor communication and listening skills has always been a plague. We are a race of supposedly intelligent human beings who are deluded assuming listening and communication skills that are clearly not present or evident. There is something very special about authentic communication, which separates it from what people normally do when they talk. In the strictest sense, what passes for communication between people, in everyday conversation, in reality, is not authentic communication at all because signals are not transmitted and received in ways that lead to the sharing of meaning or feeling. The distinctive and differentiating difference between authentic communication and typical talking is found first in the quality of listening, and most importantly, there is a communication needed between people when a signal (communication) is given, that the message has in fact been received correctly. This feedback signal is crucial and mission critical in the beginning of all real communication training. The technique of mirroring reveals almost immediately how well our communication came across, how well it was received, how much miscommunication was the fault of the listener, or how much we bungle the transmission of our meaning through inept expression. True communication consists of a sender, a receiver, and a feedback signal to the sender that the transmission has in fact been received. In order for communication to take place there must be this elementary feedback signal, which informs the source that the receiver has actually received something, otherwise communication is only one way. An exchange of meaning must somehow be confirmed. In face-to- face reality people talk but do not listen and thus much of communication between people is actually pretty much a one-way affair. People are so busy listening to their own minds when you speak to them that is all they can hear, their own thoughts and reactions. In addition, we can see this in their quick responses, which show off their lack of listening. A mirror is a reflection we give a person that starts with the words, "So what I think I am hearing you saying is…” A mirror provides an instant decisive test to the communication process. It helps both communicator and receiver. Our mirror is the feedback signal that lets the speaker know if we heard them correctly or if they have communicated their meaning with sufficient skill and clarity. accept it as a natural part of life. between human beings is such a difficult thing. Mirroring is the closest a communication technique will ever come to not being a technique. There have been many attempts to "scientize" communication and now we even have people trying to "heartize" it. 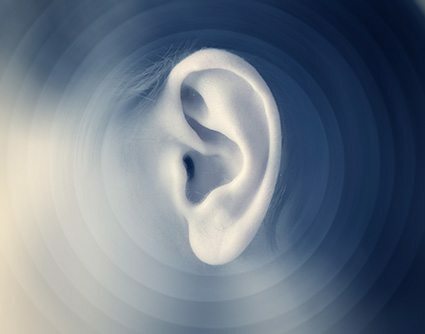 Years ago a friend wrote in response to my writings about listening saying, "I have had it with technique, absolutely HAD IT, done, finito, nada mas, terminado, fini, nix, no way, no, no, no, NO!!" 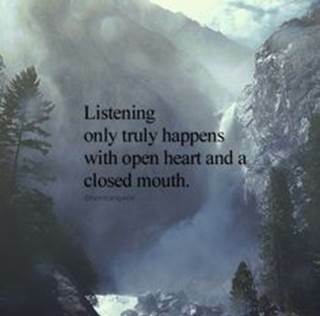 For true listening to occur the listener must concentrate totally on the other and this entails what some psychologists refer to as bracketing, which is the temporary giving up of, or setting aside of one’s obsession with one’s own inner world. Not only do we need to set aside one’s own prejudices, frames of reference, desires, judgments, expectations etc., but also we have to actually bracket our very thoughts themselves. We need to put our inner mental river on hold and this few people know how to do. 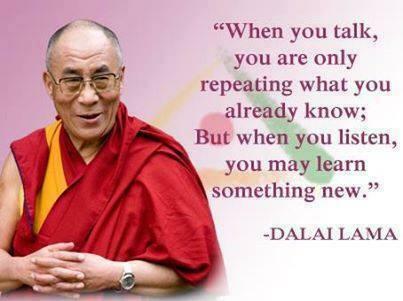 Listening is not easy. The goal in real listening is to experience the speaker’s world from the inside, stepping into his or her shoes. “Real listening requires that we get our own reactions and responses out of the way in order to hear exactly what the other person is saying. The first step is to quiet the feelings and thoughts jangling around inside of us and to put aside all reactions and "tapes" playing in our heads, spinning tunes of past feelings and ideas and future expectations,” said Christopher Hills. Mirroring is the quickest and most direct way to melt the separation that most people feel and experience with each other. Mirroring can be very threatening to us because we become psychologically and spiritually naked. The invisible becomes visible exposing all the interfering mental activity that is going on in the background. Mirroring reveals the structure of our blocks to communication thus leading us quickly to deeper communication. feeling of trust and oneness. 1) The word level – Often this is sufficient to make a communicator feel heard; other times it is a mere parroting of words by someone who has no intention of understanding a persons feelings at all. 2) The essence level – reflects some understanding of the essence of what the other person has said. Here we use our own words to sum up what we think we heard the other saying. Often another can use many words but we can mirror back with few words but still cover the points perfectly well. 3) The being level – tunes into the voice, the body language, and the general vibration of the person who is sharing. 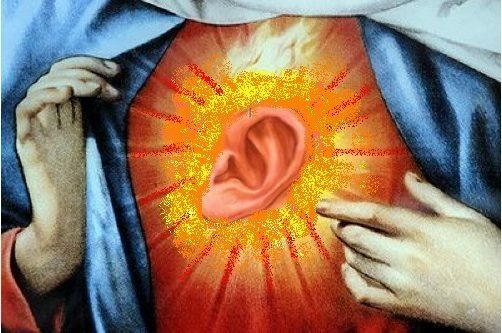 On this level we listen with our heart and open intuition. We become adept at listening to the space in-between the words to the being that is using them. This is the level of feeling and sensing the core of the others being as you listen. All loving relationships are occurring on the level of heart and being. 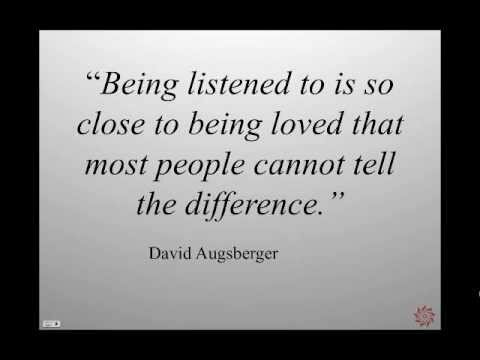 Our lack of listening cuts into this world of experience and in general most people are more comfortable dealing on the superficial level of non-listening. When we listen with our being we do not react defensively to what the other person is saying. Mirroring trains us to put our mind’s reactions aside long enough to hear the true message and communication of people. We listen because we care and because we love. Mirroring trains the intuitive faculty of perception. provides the best mirror of our capacity for love. Listening to the being of another is the highest act of caring. To listen to the level of being or soul we must be "feeling" with the other person. 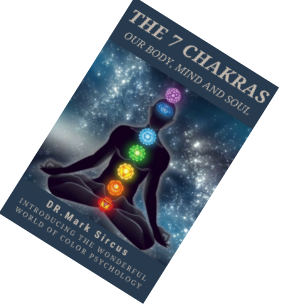 We must be feeling "one" with their inner world. This is the essence of empathy. 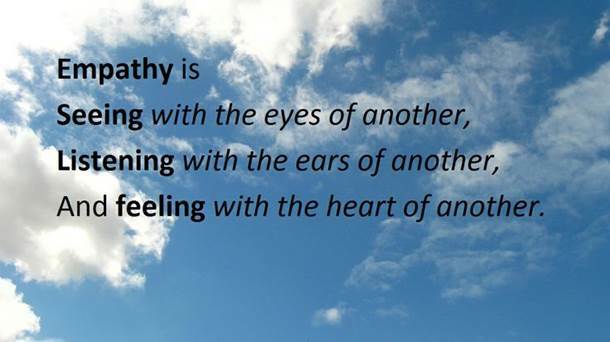 Empathy is provides pure understanding of what others are experiencing and feeling. The most essential attitude necessary for real listening and communication between beings is humility. In humility we are not assuming communication and listening, we are alert and sensitive to the process. The majority of people are assuming that they are communicating and listening on deep levels when the fact is they are not. This assumption is the primary block to communication. Deep listening is healing. Carl Rogers said, "It is astonishing how elements which seem insoluble become soluble when someone listens. How confusions, which seem irremediable turn into relatively clear flowing streams when one is heard." Most of the suffering of the world, the conflicts within our inner worlds and the greater conflicts in the external world of societies and nations are a result of misunderstandings that arise from the poverty of communication. The path of risking communication on these deepest levels is a path that will draw a person closer to their own heart, closer to becoming a bigger person, a more selfless, loving and caring being. behind the words, which may be something very different to what is said to you in words. as their words, so they feel that you are at one with them and can feel their hearts.